Dr. Martine Durier-Copp, in an May 2017 interview with CEGE Connection maintained that research is ongoing and must be integrated within our day-to-day interaction and activities. Research goes beyond academic walls for it is the foundation of knowledge exchange and is a continual process. Research is a core strength of Dalhousie’s Faculty of Management. 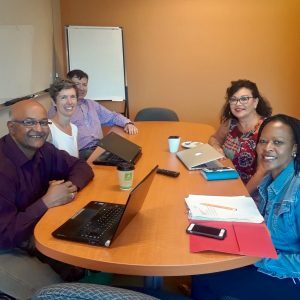 In the coming months, the SSHRC Partnership Engage Team will develop, deliver, and assess the value and impact of a set of guidelines and best practices intended to enhance the management and leadership of virtual teams within the Canadian Food Inspection Agency. 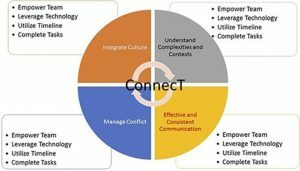 Guidelines and training will be designed to meet the specific needs of virtual teams within the Canadian Food Inspection Agency, including cultivating trust, keeping employees engaged, leveraging technology to overcome communication barriers, aligning organizational goals, and clarifying roles, objectives, and expectations. The Canadian Food Inspection Agency will benefit from finalized actionable guidelines that will enable enhanced productivity and innovation of its virtual teams and contribute to overall strengthened organizational performance and service to Canadians.